To recap our story: evolutionary biology’s ultimate quest is to explain the diversity and discontinuity we see in the natural world. A whale and a mouse are two very different things; they do not insensibly blend into one another. Yet despite their discontinuity, they also have very similar body structures. What accounts for this? And why in less extreme cases is this discontinuity at times fuzzy, such that we have difficulty telling if two different populations are different species, or merely varieties of the same species? We have also seen that the diversity/discontinuity question is simply a broader way of asking: why do things look the way they do? The answer is that an organism’s phenotype (its ‘appearance’, loosely defined, which includes external and internal, microscopic and macroscopic features) is a result of its genotype (all of its genes, the molecules that are passed from parents to offspring), the environment (all of those changes induced by the environment that are not passed down from parents to offspring), and interactions between them (such as when a certain environment triggers a certain gene). Dobzhansky made a stunning claim in chapter 2 of Genetics and the Origin of Species (1937). He claimed that the diversity and discontinuity in this world is ultimately the result of mutations. In order to make his claims, he first needed to show that mutations are not necessarily a bad thing, and indeed this he did show. Dobzhansky pictured a world in which mutations could randomly appear. Most of these mutations are ‘bad’ in the environment to which an organism is adapted, but so long as the mutations are recessive they can hide in the population-at-large in heterozygotes (individuals with one mutant and one normal copy of the gene). But to Dobzhansky, these ‘bad’ mutations are not necessarily a bad thing; given a change in the environment, these mutations may become ‘good’ and spread throughout the population. Thus random mutations can actually pre-adapt a population to an environment they have never seen. In this view, then, everything is a mutation. ‘Wild-type’ or ‘normal’ simply refer to old beneficial mutations that were so necessary virtually all individuals in the wild have them. Today we will look at one main objection to this view, and Dobzhansky’s response. Could hybridization events, like what produced this liger, explain diversity and discontinuity? This was the belief of Johannes Lotsy in his book Evolution by Hybridization (1916). According to Lotsy, there was not a shred of proof that mutations ever appear. Yet variation exists around us. Why? Lotsy argued that the true definition of a species (what would become called a syngameon, not that anyone ever uses that word anymore) is a set of organisms that breed true; that is, all of their gametes (eggs/sperm/pollen/ova) carry identical genetic information, such that when they mate with another identical syngameon all of their offspring are identical to the parents. True species, then, for Lotsy, are homozygous for every gene. Yet heterozygotes (which comprise most of the Linnaean species) are everywhere in nature! Where did this diversity come from? According to Lotsy, the first species were syngameons, but sometimes individuals belonging to different syngameons bred, creating hybrids. Every population today which contains heterozygotes is the product of just such a hybridization. Imagine that we had two different syngameons, both diploid. One had the genotype AABBCCDDEE (that is, five genes represented by a different letter, two copies (alleles) of each gene that are identical), while the other was aabbccddee (in genetics uppercase generally means a dominant allele, while lowercase means a recessive allele, but this need not always be the case). So we have one syngameon that is homozygous dominant, and one is homozygous recessive, for all five genes. If each capital-letter allele is truly dominant, this hybrid will look exactly like the first parent. If each allele is additive (that is, A does not mask a, but rather A + A = one phenotype, a + a = another phenotype, A + a = intermediate phenotype), this hybrid will be intermediate to the two parents. There are all sorts of other interactions between these alleles that could occur, causing the hybrid to deviate from either parent. So the result is, potentially, a new phenotype. But the catch is that all of these offspring will look identical. But what happens if we now cross a newly-formed hybrid with one of its siblings? Well, we have an AaBbCcDdEe crossed with an AaBbCcDdEe. Since each allele for a gene randomly goes to a gamete, we could have sperm cells of ABCDE, abcde, Abcde, abCdE, etc, and eggs cells of the like. These will randomly join to form the offspring. Rather than being identical, these offspring would exhibit a great deal of variability – up to 243 different genotypes! For organisms that produce a lot of young, all possible forms will indeed be produced. Two of these will be identical with the syngameons, one will be identical with the parental hybrid, and the rest will be completely new. Lotsy did an experiment to prove this. 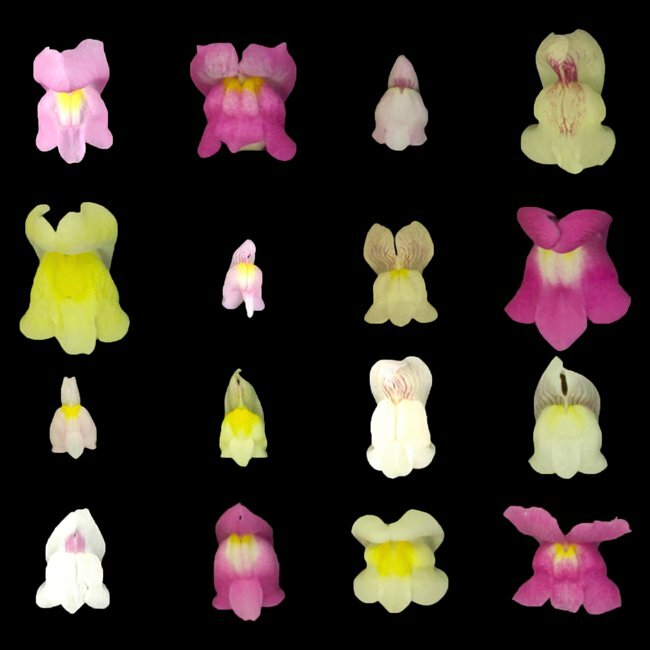 He took two species of snap-dragon (not syngameons but Linnaean species) and bred them together. The offspring exhibited the same amount of phenotypic variability as the parents. But when he crossed these hybrid offspring, the result was hundreds of plants, no two of which were identical, none of which were exactly like the parental species, one of which had traits that had never before been seen in nature (rather than just a new combination of old traits), and many of which looked like members of other species of snap-dragons that were not a part of the cross. So, argued Lotsy, selection could now work on these new variants to establish hybrid populations that would be discrete species in the Linnaean sense of the term. Indeed, said Lotsy, this is exactly what happened in the past. From a set of distinct syngameons comes all of the diversity that we see today. Every variation, from the differences in hair, skin and eye colour or blood type among humans, to the differences in shape between dolphins and whales, could be attributed to such hybridization. I am not sure how far Lotsy took this. I know he argues that this began in the earliest regions of the fossil record, so presumably the difference between a mouse and a whale arose via a series of hybridizations as well. The important thing here is that no new variant arose through mutations. Hopefully you now understand why Dobzhansky felt that he needed to prove that mutations do indeed occur in nature. This shows the importance of that Jimson weed experiment I described before, in which a fully homozygous individual, when crossed with itself, produced a rare variant that could only have been the result of a mutation. So, says Dobzhansky, mutations do occur. And Dobzhansky does not for a second doubt that hybrids can form new varieties. But, he says, those two distinct parental forms that produced the hybrid did not always exist. Even if they were the result of other hybridizations, eventually you run up against a wall, beyond which you must ask – where did the first species come from, to begin this chain of hybridizations? Mutation is a more powerful explanation, because it does not require the simultaneous creation of different syngameons. Rather, once life began with genetic material, mutations could form to fuel the evolution of that first life. And if mutations occurred in the past, there is no reason to suppose that they are not occurring today. And, indeed, they are. But how do we get from mutants to new species? It is not enough for a ‘good’ mutation to arise; there needs to be a way to prevent the mutation from entering a related population. Argues Dobzhansky, mutations provide variation, selection acts on variation, but it is reproductive isolation combined with selection and mutations that forms new species. Dobzhansky’s model for species formation was later taken up by Ernst Mayr, and then Jerry Coyne, Alan Orr and others. It is the basis for the biological species concept which, although having its faults, is a useful way of explaining the diversity and discontinuity we see in sexual species. Mutations arise in a population; combined with the recombination of already-existing variation (itself a product of mutation), differences between individuals are formed. This population may, for whatever reason, split into two. At first these two populations are genotypically identical, with the same mutations in the same proportions. But new mutations start to show up in one population that do not show up in the other. Furthermore, if the environments in which these populations find themselves differ, some alleles will be selected for in one population but selected against in the other. This combination of mutations and different selection pressures turns the populations into different races of the same species (think today of the differences between forest and savannah African elephants, or the differences in the number of spots found in different ladybug populations in Europe). Some mechanism (to be discussed later) may eventually cause hybridization between these races to be impossible; the genetic differences between them are thus preserved. When this process is complete, we now have two distinct species. Given enough time, this combination of mutations + differential selection + reproductive isolation = all of the diversity and discontinuity on this planet. This model for speciation is, with a bit of tweaking, still in use today, and has been experimentally validated. But this does not mean that Lotsy was completely wrong. Hybridization also remains an important aspect of speciation. In Dobzhansky’s model it is the inability to form viable hybrids that signals the end of speciation; in Lotsy’s model it is hybridization itself that forms new species. Indeed, today we recognize that some of the most dramatic examples of speciation occur via hybridization: two species breed, producing a hybrid that is so different from either parent it is incapable (or unwilling) of breeding with the parental kind, and must breed with itself or others like itself. Or it cannot persist in the parental environment, but can persist in an intermediate environment where the parents are rare or absent, and thus has no choice but to mate with its own kind. Of course, the differences between the parents themselves arose via mutation. The best example of Lotsy’s speciation-by-hybridization is a form of polyploidy. I keep dangling this term before you; we will get to it soon enough, because it is a fascinating example of evolution-in-action, and Dobzhansky devotes an entire chapter to it. In short, understanding mutations is central to understanding evolution. Before you can understand natural selection and how it works, you need to know that mutations arise, that they can be beneficial, and that they are necessary but not sufficient for producing the diversity and discontinuity that we see in this amazing biological world.